SpaceX CEO Elon Musk unveiled an ambitious plan yesterday to fly two private space tourists around the moon in 2018. The move drew a commendation from NASA along with a clear reminder that the agency expects SpaceX to meet its other obligations while pursuing the moon. In a teleconference with reporters Monday (Feb. 27), Musk said SpaceX will launch two paying passengers around the moon using the company's Dragon crew capsule and massive Falcon Heavy rocket. Both vehicles are scheduled for unpiloted test flights later this year. Under the SpaceX plan, passengers would take a trip on Dragon and loop around the moon, "skimming" above the lunar surface at the closest point and flying out up to 400,000 miles (650,000 kilometers) from Earth at the farthest point. The entire trip should last five days, Musk said. The flight could launch near the end of 2018, and potentially coincide with the 50th anniversary of NASA's historic flight of Apollo 8, which launched the first Apollo astronauts around the moon in December 1968. SpaceX has a $2.6 billion contract with NASA to fly astronauts to and from the International Space Station using its Dragon crew capsules and Falcon 9 rockets, which are smaller than the Falcon Heavy. 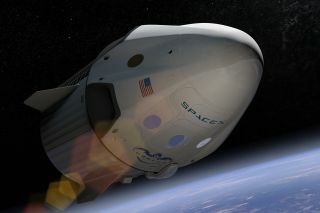 Those flights are funded through NASA's Commercial Crew Program and were expected to begin in 2018, though a recent report from the U.S. Government Accountability Office said that the first crewed flights by SpaceX's Dragon and Boeing's CST-100 Starliner (NASA's other astronaut taxi choice) will likely slip to 2019. SpaceX has been flying unpiloted Dragon cargo ships to the International Space Station since 2012 under a separate contract with NASA. Another company, Orbital ATK, has been doing the same with its robotic Cygnus supply ships since 2014. A third company, Sierra Nevada Corporation, is developing a robotic Dream Chaser space plane to deliver NASA cargo as well. "For more than a decade, NASA has invested in private industry to develop capabilities for the American people and seed commercial innovation to advance humanity's future in space," NASA officials wrote in the statement on SpaceX's moon plan. "NASA is changing the way it does business through its commercial partnerships to help build a strong American space economy and free the agency to focus on developing the next-generation rocket, spacecraft and systems to go beyond the moon and sustain deep space exploration." Musk told reporters that NASA would have first pick on the 2018 moon flight, and SpaceX would bump the two space tourists (who have already placed a "significant deposit" for the trip) to a later flight if the space agency wanted the seats. Musk did not reveal who had purchased the moon flight seats on Dragon, or how much the trip cost per person. "NASA always has first priority," Musk said yesterday. "So if NASA decides to have the first mission of this nature be a NASA mission, then of course NASA would take priority." "This first demonstration mission will be in automatic mode, without people on board," SpaceX representatives wrote in a separate statement Monday. "A subsequent mission with crew is expected to fly in the second quarter of 2018. SpaceX is currently contracted to perform an average of four Dragon 2 missions to the ISS per year, three carrying cargo and one carrying crew. By also flying privately crewed missions, which NASA has encouraged, long-term costs to the government decline and more flight reliability history is gained, benefiting both government and private missions." The moon flight and commercial Dragon flights for NASA will serve as steppingstones for SpaceX's ultimate goal, building a sustainable colony on Mars, Musk said. "This should be incredibly exciting," Musk said. "Next year is going to be the big year for carrying people to the space station and hopefully beyond." Editor's Note: This story was updated on March 7 to correct the name of the Sierra Nevada Corporation developing the Dream Chaser space plane.